Friday 17 June 2011 saw the gathering of a group of wild young things who had come to gather for a common purpose, to explore The New Society in Principle and Practice. 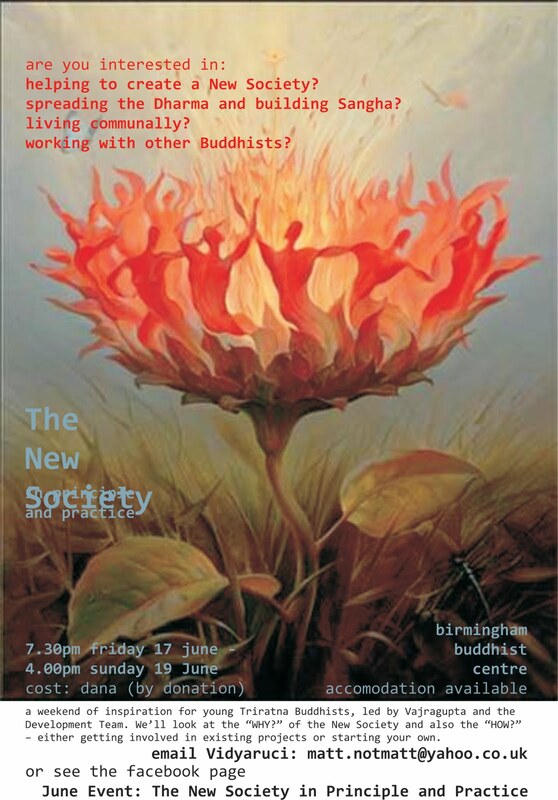 It was the Triratna Young Buddhist’s weekend in Birmingham and with such a title it was never going to be a passive affair - there was a feeling of revolution in the air! Beforehand we were promised a very comfortable place on the floor of the Birmingham Buddhist Centre, but on arrival were very disappointed to be told there was enough room for us all to have a proper bed with a mattress and everything - so much for developing my ascetic qualities! We arrived to a wonderful supper cooked by the one and only Sanghadeva who selflessly cooked the most delectable cuisine for us all weekend. We then had an introduction to the weekend and each other and a dedication ceremony in the shrine room. Then back to the annexe for us girls, throwing out the boys who were staying there as part of Vidyaruchi's six-month Dharma course (thanks boys!). Saturday saw a great talk by Vajragupta on the meaning of the New Society and set it in the context of what the Buddha taught on the importance of Sangha to the spiritual life as told through stories from two suttas in the Majjhima Nikaya. This set the tone for us to explore in groups people’s experiences of living together harmoniously or unharmoniously, and the lessons learned. In the afternoon we had a series of talks (expertly compered byJnanarakshita). Claudine from Lamas Pyjamas in London gave a great talk about setting up a team-based Right Livelihood (TBRL) business, and about the charity shop as a model. I found this really inspiring and it was also very helpful to make contact with Claudine as we have been exploring setting up a TBRL charity shop in Leeds and listening to how easy Claudine found the process made our ideas seem all the more possible. The evening puja led by Lokabhandu was amazing - it had me quaking in my boots at first but in the end I was really pleased to have done it. At the offerings stage of the puja we each had to go up and select from a number of objects on the shrine: a vajra, a sword, a bell and a flower. We had to take hold of the object that spoke to us most and raise it in the air, turning to the group and declaring "my name is _, and I practice in the world with _". So, for example, I chose the vajra and declared "My name is Debbie and I practice in the world with courage". This seemed to have a really strong effect both for me and everyone else in the room. Each time someone else got up and made their declaration it was celebrated by everyone in the room with claps and cheers. It was really powerful and there was something about being 'seen' that was really effective. After breakfast on Sunday Lokabhandu gave a talk that launched the guide he and others have recently produced called 'a guide to starting a community'. This looks at many of the practical and spiritual considerations one might make when starting up a Buddhist community. Talks then followed by Ben Niblock who talked about teaching the Dharma as a younger sangha member, and used a fabulous metaphor about how new ideas and concepts could be seen as magic beans that you are trying to plant in established soil that may upset the turnips around them initially but which could eventually transform everything into something really magical (apologies if I haven't got this quite right - it was slightly surreal and completely enjoyable!). And Sue Susnik then gave an inspirational talk about dana and why she feels so passionately about working in the development team and looking at fundraising strategies in the movement. The energy from these inspiring talks made us buzz with ideas so the exercise after the tea break was just what was needed. Lokabhandu set up an open space where people who felt moved-to offered ideas they wanted to explore deeper and these ideas became themes for discussion groups for people to drop in and out of. This worked really well in practice and lots of actions have already taken place following the retreat as a result of these discussion groups, including an (already very active) Triratna Arts group on Facebook and an Empowering Dharma Outreach group that is looking at making the Dharma as inclusive and accessible as possible to some of the more vulnerable groups in society, and many more. As part of the closing ritual we all had to come up with three words that summed up our experience. Mine were INSPIRED, MOVED, EXCITED. That still sums things up really, it was an invaluable experience and I will definitely be going along to the next young Buddhist's event. Many thanks to the organisers and everyone who took part!